Colombo, February 9 (www.latheeffarook.net): On February 4th, the country celebrated 71 years of Sri Lanka’s independence. Freeing the country from foreign rule is of course, an occasion to be jubilant. However, under the existing circumstance, the need of the hour is to do some stock-taking and assess the country’s performance since independence to understand where we were during the time of independence, where we are today, who is responsible for the current mess and what needs to be done. Sinhalese, Tamils, Muslims and all other citizens wanted to live in peace and harmony and move ahead as they did in the past. However it became a distant dream due to the short-sighted racist politics of the two major political parties-United National Party and the Sri Lanka Freedom Party- which ruled the country since independence and divided communities for their political survival and brought about today’s chaotic situation. Instead there emerged worst forms of racism, crime, corruption and lawlessness. While Tamils were vanquished racist politicians turned their agenda on Muslims-the second largest minority living scattered all over the island. Racist elements were given free hands to unleash violence against Muslims, frighten and suppress them. To free from Rajapaksa reign, people voted President Maithripala Sirisena and Prime Minister Ranil Wickremesinghe to power. However, they miserably failed to fulfil their pledges. No one accused of crime and corruption was brought to justice. People were fed up and did know where to turn to. In the midst there emerged rift between President Sirisena and Prime Minister Wickremesinghe dealing a deadly blow to the hopes of the people. 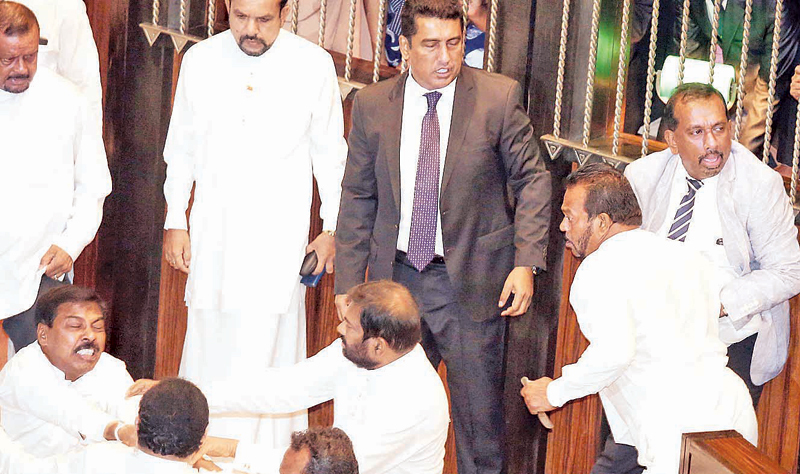 The Central Bank Bonds scam involving Prime Minister Wickremesinghe and the related vote of no confidence shattered the country. Seven decades after independence today Sri Lanka is one of most mismanaged countries in the world. There is political chaos, serious economic crisis, social unrest, rampant corruption, communities remain divided with the gap continue to widen, violence unleashed against Muslims killing innocent Muslims and destroying their economic base perhaps to please Sinhala racist elements, ever-widening economic gap, disintegration and the collapse of social order. The highest allocation of Rs 390.3 billion is for defence in the estimated government expenditure for 2019. This is a colossal sum of money which, otherwise, could have been used for raising living standards of people. Sixty years later in May 2007 Indian Nobel Laureate Amartaya Sen, rightly said that Sri Lanka failed to realize how precious and valuable the richness of the country’s plurality was by taking a position of upholding exclusive status to Buddhism and Sinhalese and isolating the other sections of society from having a sense of national identity. In his independent day message President Sirisena said that the common enemies of the progress of national revival were poverty and corruption. The question is that he was in power for more than four years and what has he done to eradicate poverty and corruption. Absolutely nothing. He had all the opportunity to bring the corrupt to law. But he threw the opportunity away. There is disillusionment everywhere. People of all communities who wanted to bring up their children in a cultured environment now ask-what is the future for the next generation. Some wanted to migrate. How many could do that? This is the reason why independence day should also be a day for stock-taking of our performance for the people to know where we are and what needs to be done.